Not sure if I’m going to be doing a whole series of cancer poems or if these are just a temporary product of adjusting to my new state. At any rate, I found myself writing this in my head in the middle of the night as I lay unable to sleep. I’m still too close to it to judge whether it’s any good, but I decided to post it anyway. in the age-old sign of surrender. of my voyage to survival. Imagine looking forward to a midnight steamboat excursion on the river, only to have your plans disrupted because your employer is late coming back from an errand and you don’t get off work in time. You go to bed bitterly disappointed . . . and later wake up to the terrible news that the boat sank in the river and several of your friends and acquaintances have drowned. The tale of a young woman who experienced such a shock is the dramatic opening to the book The Wreck of the Columbia by Ken Zurski. 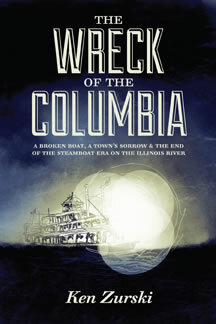 The Columbia was a steam-powered, paddlewheel, riverboat. At its last inspection, it had been called the safest boat in western waters, but on July 5, 1918, it suddenly sank in the Illinois River and broke apart. Of some 500 passengers aboard the vessel that night, 87 died. Zurski has resurrected this story from the forgotten pages of history. His well-researched account includes profiles of many of the passengers aboard the steamer that fateful July night as well as a brief history of steamboats and the towns of Pekin and Peoria, which were most affected by the disaster. He recounts the heroic attempts to rescue the people who were trapped in the wreckage and later to salvage the bodies so they could be returned to their families for burial. Zurski goes on to explain the investigation into the causes of the sinking and the legal proceedings that followed. The account also contains several brief tangents to help people better understand the time period in which the accident happened. 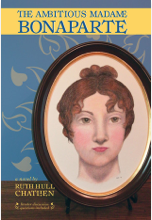 One nice touch to the book is that each chapter opens with a photograph of a person or object of interest to the story. The images help put a human face of the disaster. I think this book has a wide appeal. People interested in the history of the early 20th century, the Midwest (especially Illinois), and transportation should find it fascinating. And, of course, the book is a natural for anyone who’s been fascinated by the history of the Titanic or Lusitania. While the death toll from the sinking of the Columbia was much smaller than either of those two tragedies, it still made national headlines, and it had a devastating effect on the town of Pekin. My major complaint with the book is that it doesn’t have an index. The stories of some of the passengers are told in installments in different chapters, and when I hit the later parts of those stories, sometimes I wished I could easily find the earlier mentions. Still, it was an engrossing history, and I highly recommend it. escaping through the nearest crack. The other day I mentioned that I recently had another biopsy. The results came in yesterday. My lymph nodes are clear, so we caught the cancer at the earliest stage before it has spread at all. I still need preventive treatment to reduce the risk of its coming back, but it shouldn’t be too bad. This was the best possible news at this stage, and I’m very grateful. I ring the doorbell and pound on the door, and then I wait. After about 20 seconds, I ring and pound again. As Tuffy prances from foot to foot, he senses my frustration and starts barking. We ring, pound, and bark, ring, pound, and bark for at least five minutes. Slowly, I understand that because our bedroom is the room furthest from the door, Jay cannot hear me. Turning around, I glance down our street, but every house is dark. A sharp gust of wind flings icy snow into my face as though the neighborhood itself has turned hostile. Only one plan occurs to me. I pick up Tuffy, cross the driveway close to the garage door, and wade into the side yard. The houses are about 20 feet apart here, and the pattern of drifting has left an area where the snow cover is only ankle deep. Maybe this won’t be so bad, I think and try to ignore the way the cold is making the bones of my feet ache. Prospects turn ominous as soon as I round the corner of the house and enter the back yard. Because my neighbors haven’t planted many trees or shrubs, the raging prairie winds have created huge drifts here that look like a white Sahara. Some of the snow is piled four feet high. I plow into the yard, heading for our dark bedroom window at the opposite end of the house. Even though I choose the places where the snow is lowest, I still have to trudge through knee-high drifts. Walking this direction, I’m heading straight into the fierce wind that scoops up the top layer of snow and bombards me with it. Within seconds, my face feels sandpapered. By the time I reach the back of the house, I’m out of breath from carrying 18 pounds of wriggling canine while acting as a human snowplow. A vise of cold is tightening around my asthmatic lungs. I pound on the window, pause to take several shallow breaths, which are all I can manage, and pound once more. Then feeling dazed, I continue my circuit of the house. Rounding the corner, I find myself in a more sheltered area. The neighbor on this side has a two-story home, which blocks the wind more than our one-story model. I make good progress until I reach the front yard, where the sight of massive drifts halts me and fills my eyes with tears. As much trouble as I’m having breathing, I’ll never make it across that wilderness. Instead, I take the long way around, across the comparatively flat snow of my neighbor’s front yard to the curb, down the street to our driveway, and then up the drive to the house. The living room is still dark, and I cannot open the door. My skin burns where my legs were immersed in the snow with only flimsy pajamas as protection. My lungs ache more than ever before in my life. Holding the dog close to my chest, I lean my head against the narrow window that runs vertically alongside the door and wonder what to do. My thoughts move as slowly as a ship in ice-choked waters. I know I cannot make another trip through the snowdrifts to the back window. I can’t think where to go. The ranch house to the east is empty, the result of an autumn foreclosure. The house to the west and the one directly across the street are two-story houses with the bedrooms upstairs, so I doubt my neighbors will hear the doorbell any better than Jay does. Lifting my head from the window, I turn stupidly toward the doorway. Jay is standing there looking worried by my lack of response to the door opening. He takes the dog from my arms and leads me inside. While I strip off my coat and boots, I tearfully tell him to get my inhaler. Only after I take two puffs of albuterol do I explain what happened. Then I go to the bedroom to strip off my snow-encrusted pajamas. My lower legs are the color of an almost-ripe tomato, and my toes feel as though a falling block of ice has crushed them. My lungs still ache, and for a few moments I lean against the bathroom vanity and work at deepening my breaths. Then I take several minutes to rub lotion into my chapped skin. As I pull on heavy sweatpants and two pairs of wool socks, Jay brings me a cup of green tea liberally laced with honey and lemon. I drink it and then climb back into bed, where Jay and Tuffy join me. The dog lies on his back between us, snuffling and grunting as if to tell us his version of the adventure while we rub his chest. Down in the depths of the bedclothes, my feet are prickling and my calves throb. I wonder if the skin is still bright red. At least the tightness in my lungs has started to ease. The thought flits through my mind that for once he’s the one who is catastrophizing . . . except that I know he isn’t. If I’d had a more serious asthma attack or if hypothermia had set in, my husband could have awakened later that morning to find that he’d lost both of us. “Well, that didn’t happen,” I say and snuggle closer to him. For a moment, I flash back to my struggle out there in the snow. As I plodded through the drifts, I couldn’t allow myself to think about whether I was going to survive the situation. All I could do was to take one step and then another, each on the assumption that I would live. I remember the hiking trip Jay and I took the first summer we were married, during which my feet developed blisters the size of walnuts. At the time I was convinced we would have to camp somewhere until I healed, but the next day, Jay bandaged my feet and transferred half the items from my backpack to his and never once complained that he was carrying more than his share of the weight. Suddenly, I want to tell him that I’ve learned a lesson from the near-death experience, that I won’t obsess over trivia anymore and that I’ll try to hold onto the faith that somehow we’ll get through the tough times. But even the euphoria of survival can’t prevent me from seeing that such a pronouncement would be glib. Ultimately, I’d end up disappointing myself if I swore to make such an unrealistic overhaul of my personality. He kisses me on the forehead. “We’re going to get through this, you know.” Settling down beside me again, Jay smiles. Then he hugs me more tightly, and I drift off to sleep in the security of his embrace.